The Copa Del Rey match between Valencia and Villareal at the Mestalla finished in a goalless draw in what was a pretty exciting match for Valencia fans and not so much for Villareal fans. Even though Valencia only managed to draw with Villareal, the players were playing great most of time time with the exception of our striker Aduriz who managed to screw several cahances. The match started with Valencia being the dominant side even though from the formation Emery did you would think Valencia would be too defensive. That was not the case and Valencia started attacking from the first minute. The first chance for Valencia was in the 6th minute and quickly after that followed several opportunities mainly involving Mata, Pablo and Aduriz, but they couldn't be converted. Later in the match Pablo had a brilliant chance as he was one on one with the Villareal goalkeeper, but Pablo seemed to panic and shot wide of the goal. In the meantime Aduriz had several opportunities, but each and every time he chose the wrong option, header instead of calming the ball and shooting, calming the ball instead of shooting and all kind of bad calls that could have been goals. In the second half Valencia were dominating once again, with the rare forays forward from Nilmar and just a few dangerous chances for Villareal. With the 60th minute coming up and the result 0-0 Valencia coach Unai Emery decided to make some changed and introduced Joaquin for Pablo, which to me was the wrong option and he should have removed a defender and placed Joaquin. Until the end Valencia had numerous chances that Pablo, Mata, Aduriz and later on the substitutions Joaquin and Soldado managed to miss. There was no doubt that Valencia was the better team, but with so much misses up front it was clear Valencia wouldn't be able to win. Valencia CF (0): Guaita; Mathieu (Jordi Alba, min. 79), Stankevicius, Dealbert, R. Costa, Miguel; Maduro, Albelda, Pablo (Joaquín, min. 59), Mata; Aduriz (Soldado, min. 65). Villarreal CF (0): Juan Carlos; Ángel, Musacchio, Gonzalo, Capdevila; Cani (Senna, min. 46 (Altidore, min. 71), Borja Valero (Mario, min. 90), Bruno, Cazorla; Nilmar и Rossi. Guaita 6.5 - Not much to do, but did made one great save and was always alert. Miguel 7 - Great night for Miguel, ran all night up and down the field and his crosses were great. Stankevicious 6.5 - Did not have much to do, but made 2 important interceptions and often moved forward to help the middle. Dealbert 6 - Did not have too much to do, caught out of position twice, but overall good. R. Costa 6 - Made two crucial tackles and did a good job overall. Mathieu 6.5 - Was good in his offensive runs especially in the first half, but a bit unsure defensively. 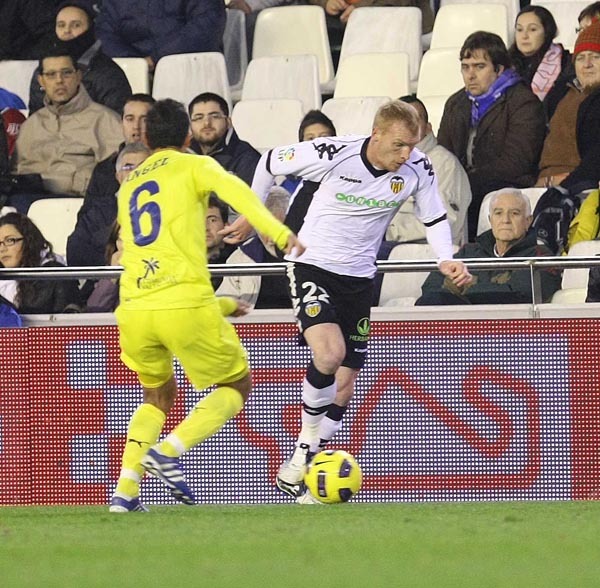 Pablo 7 - He did a great job and was involved in most Valencia attacks, though missed a perfect opportunity to score. Albelda 5.5 - Lost too much balls and his passing was not very good, did not bring anything offensively. Maduro 6 - Great in the first half, but faded out in the second. Mata 7 - Involved in most of the attacks, combined well with all players and had few chances, but it wasn't to be. Aduriz 5 - Missed a lot of chances and did not present a threat at all. Joaquin 6 - Replaced Pablo, but wasn't better than him and could not make an impact. Soldado 6 - Replaced Aduriz, but wasn't much better than him.